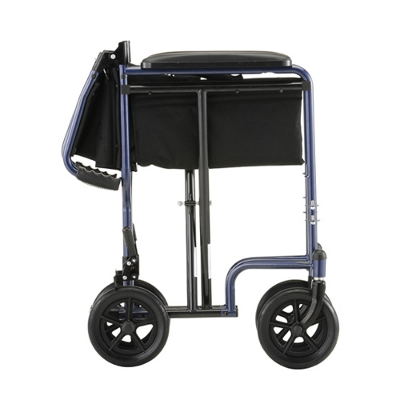 Transport Chairs are extremely lightweight wheelchairs, without the large rolling wheels on the side. Transport chairs are designed for the person in need to be pushed rather then wheeling themselves around. Boulder transport chair rentals have a sleek design with a narrow profile, manual rear locking brakes and fold up flat. Compared to wheelchairs, transport chairs only weigh about 25 lbs making it easy and convenient to travel with and take in and out of the car. 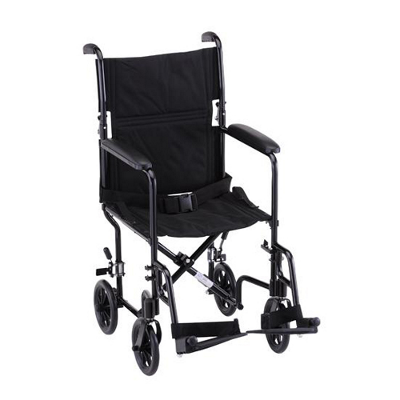 Rental transport chairs are perfect for trips to the doctors office and appointments, getting through narrow doorways in the house, and for those that will not be wheeling themselves and will have someone helping wheel them places. Independently Yours Medical Supplies in Louisville, CO carries transport chairs for rent in both 19″ and 22″ seat widths. The 22″ transport chair and one of the 19″ models feature dual locking hand brakes, 12″ rear wheels, and flip up armrests. Call or visit us to rent a transport chair for the day, week, or month. Weight Capacity: 300 lbs and 400 lbs. – Weight Capacity: 250 lbs. – Product Weight: 23 lbs. – 6″ wheels. Manual locking rear brakes. – Easily folds up in the middle of the seat. Back folds down. – Product Weight: 28 lbs. Boulder Transport Chair Rentals are available for walk-in rentals or can be reserved. If you are visiting town, or live in Boulder, Louisville, Superior, Broomfield, Arvada, Golden, Westminster, Lafeyette, Longmont, Brighton, Thortnon, Denver, Commerce City, Erie, and more.